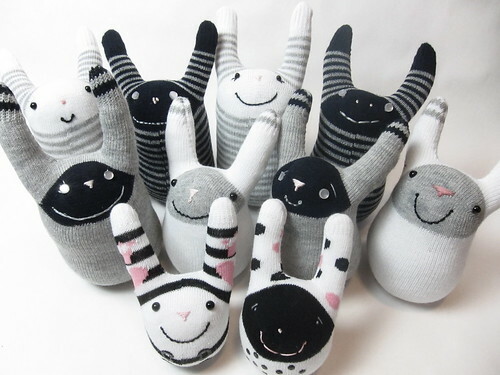 Finished all the sock bunnies I need to help the Easter Bunny fill a few baskets this year. There is one I may redo the face on but otherwise I think they have lots of personality. You’re probably all tired of seeing them but they’ve been my main project that last couple of days. I do wish Joann’s carried safety eyes in a color other than black so I could have used them on the ones with dark faces. I did find this Etsy store that carries lots of colors so I’ll have to order some from them for other projects in the future. I love these bunnies, so, no, I'm not tired of your pictures! Wish I could find the pattern. The library does not have that particular book. So cute! so what have you used for safety eyes on the ones with black faces? Sea – I used small white buttons on the ones with black faces & those will only go to the kids that are over 3.